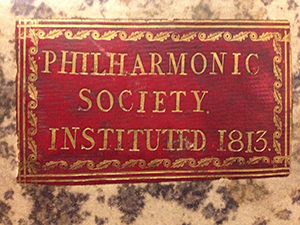 My first visit to the Royal Philharmonic Society’s archive; a wealth of scores, letters, papers and miscellanea that trace its 200-year history of music-making and commissioning, was well overdue. In truth, my overriding memory of archives is of long hours spent in search of the magic document which would transform my thesis into a revelatory masterwork (alas, it proved elusive). However, even a superficial exploration of the RPS collection, under the expert guidance of RPS council member and British Library curator Nicolas Bell (and free of impending deadlines), offered a fascinating window on UK concert performance history. Sold to the British Library in 2002, and so providing the RPS with the stable financial foundation it had lacked throughout its past, the collection is now housed in the library’s cavernous basement, which extends to a depth of over 24 metres. A conveyor belt system whirrs overhead as publications (the library owns over 150 million in total) are ferried across the building. Among the 270 scores in the RPS archive is the autograph manuscript of Mendelssohn’s First Symphony, which the composer presented to the Society after giving the work’s premiere with them in 1829. The collection also includes autographs by nineteenth-century composers who have stood the test of time less well: Ignaz Pleyel, Cherubini, Sigismund Neukomm, Spohr, Cipriani Potter and William Sterndale Bennett. 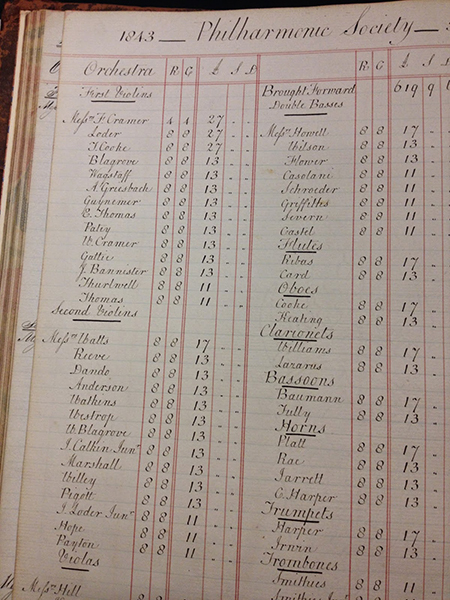 Equally revealing are the documents relating to the day-to-day running of the Society. Minutes which (once you have deciphered the fountain pen scrawl) describe, for example, concern over whether or not to invite Richard Wagner to conduct the orchestra in 1855. (He came, but the experience was mutually disagreeable.) From a seemingly insignificant list of the Society’s orchestral players, it is possible to gauge a surprising amount about the orchestra in the early nineteenth century, from the quantity, hierarchy and fees of the players, to the Germanic and Italian names suggesting musicians who had come from abroad. 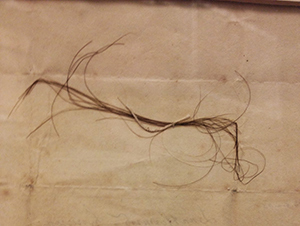 There’s also some downright weird stuff, such as the strands of Beethoven’s hair gifted to the Philharmonic Society; one of many keepsakes taken from the composer’s death bed. Of far more historical significance is the score of his Ninth Symphony, sent by Beethoven to the Society in 1824. It carries his autograph dedication to the society and the copyists’ work is liberally corrected in Beethoven’s hand. Other composers had a less productive relationship with the Society. I stumbled across a letter from a young and relatively unknown Edward Elgar, who was ‘naturally anxious to obtain a hearing in London at the Philharmonic’. The response clearly displeased him; a subsequent letter affirmed ‘I, of course, do not intend to “submit” any composition of music to the judgement of your “Directors” (although the relationship would later flourish with Elgar’s rising success).